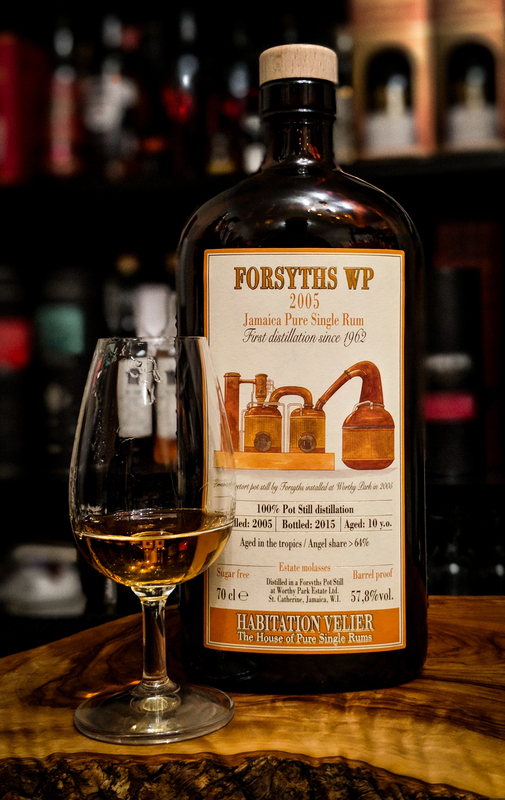 Well OK, if we’re being honest it should be the Habitation Velier Forsyths Range as though the distillery name is there, it’s not there where it matters….which is in the large letters adorning the top of the label……yet. 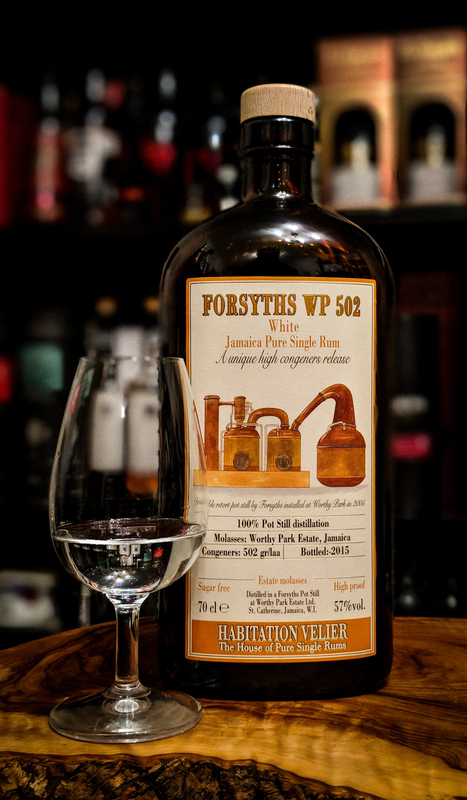 I picked up the first releases in the range early doors when the Habitation Velier concept was introduced and immediately picked up the Forsyths WP 502 and Forsyths WP 151 Proof. 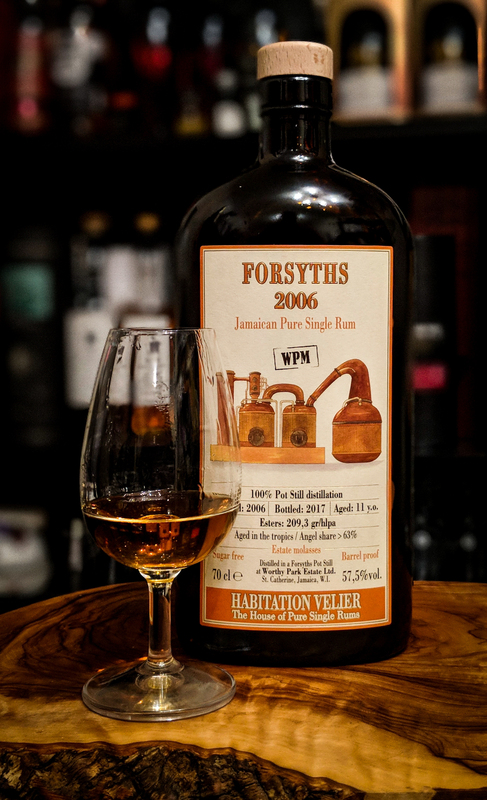 This was then quickly followed by the Forsyths WP 2005 when released and the latest addition arrived over UK Rumfest weekend….Forsyths 2006. I recently published an article about the Worthy Park Estate Signature Range which you can read here……I’d say that its worth a read. That’s kind of all that there is to say before moving onto actually appraising the Rums…..which is of course why you’re here. Firstly the 502 in the name directly relates to the congener level of 502 gr/laa….or in layman’s terms….pungent. This also (as far as marques go) puts it firmly in the WPE category (WPE – Up to 800 gr/laa). This Rum is distilled from a wash that undergoes a 3 month fermentation period to create all of those flavours and aromas that will be extracted in the Forsyths Double Retort Pot Still. Glass: Crystal clear. Very oily. Waxy. Viscous. Initial aromas are all varnish and incredibly powerful acetone. Pear drops. Deep molasses. Creamy, overripe bananas. Natural yoghurt??? There is also an underlying sweetness to the whole affair with Banana Jam. It’s very aromatic with almost floral notes popping up until the brine, olives and coastal notes hit home. It’s incredibly ‘funky’ and unbelievably lovely stuff. Mouth: Remarkably approachable. Sweet entry initially before the peppery bite and heat build to a crescendo. A creamy, almost milky coffee. Overripe banana which is the Worthy Park trademark. Fresh sugarcane. It’s very agricole like, but in its sweetness…its not really a vegetal Rum. Fresh coconut shavings. Salty. coastal. The finish is relatively short in length but it crams a lot in…..Brine. Olives. Pineapple. Overall it is not as ‘giving’ as the nose suggests but man its massively impressive. Imagine this with 5 years tropical age…Take. My. Money. This is very much a more intense, higher abv version of the WP 502….best used in mixed drinks…..does go unbelievably well with Ting and makes a killer Daiquiri. I’ll focus this brief set of tasting notes on the additions to the notes found in the WP 502. In the glass there is a very obvious apple turnover and marshmallow along with a real herbal quality (think marjoram). It has hints of Bajan Blackened Spice Mix. In the mouth the molasses is thicker, heavier and almost chewy….though there are lighter moments with vanilla and citrus oil. Cloves and apple juice round things out. I’d love to taste this Rum fresh from the still. That’s the dream. This Rum was from the first distillation at Worthy Park Estate in 50 years. It is the WPL marque which is the most commonly aged marque produced by the estate (WPL – 60-119 gr/laa). Distilled in 2005 it sees just over 10 years of tropical age. There was a loss of in excess of 64% due to evaporation during that 10 year period which averages at 6.4% loss per year. Crazy. Glass: Oily. Beeswax. Overripe Bananas. Bourbon Oak. Dulce de leche. Chocolate. Dried tropical fruit. Light acetone. An almost Rye Whiskey spice to it. The ex-bourbon barrels have had a huge impact. Sweet. Lightly medicinal with smoke and leather. Quite floral. Mouth: Quite astringent from the off. Oily. Warming. Almond milk. Heavy drying bourbon oak influence. Powdery cocoa. Kinder Bueno. Growing sweetness. Fruit and nut chocolate. Dried banana chips. Rye spice. It skirts very close to whisky territory with its spiced oak but stops just short thankfully. A medium length finish that is heavily bourbon oak led….slight cocoa and nut sweetness gives way to dryness. Cigar smoke. This could genuinely be a good Jamaican Rum for a newcomer. Forget the sugary gateway tripe…this is Jamaican enough to give a really solid grounding yet approachable enough to be enjoyable as the pot still is dialed down a touch by the oak. It all plays really well. Nose translates to palate. It gives easily. Distilled in 2006 and bottled in 2017, this Rum carries the WPM marque (WPM- 120-239 gr/laa) so we’re kicking things up a notch here. Aged for a full 11 years in a tropical climate, losses were in excess of 63%. Glass: The closest thing that I’ve had to the sheer punch of LROK without being from that distillery. Oily. Wow. You get that stinging bright acidic fruit note upon first pour reminiscent of so many classic Jamaican Rums. This is a brute. No dunder remember. Time, and it needs time, gives acetone. Heavy stinging acetone. Sharp tropical fruits. Mango. Starfruit. Fruit Salad chewy sweets. A solid medicinal note binds the aromas together. It leads with sweetness, that trademark Worthy Park overripe banana is here in abundance. Banana bread. Sticky ginger cake. Peppery oak brings iodine. Smoked cheese. Brine. Olives. Citrus. Acetone is ever-present with the medicinal, coastal notes. Very deep. Very revealing. Rewarding. Worthy Park Estate really are hitting their stride in terms of the Rums that they’re producing. A real quality output from some really great people. Buy all of the above now alongside their flagship Signature Range and you’ll be rewarded with hours of enjoyment and maybe a new favourite Rum producer. 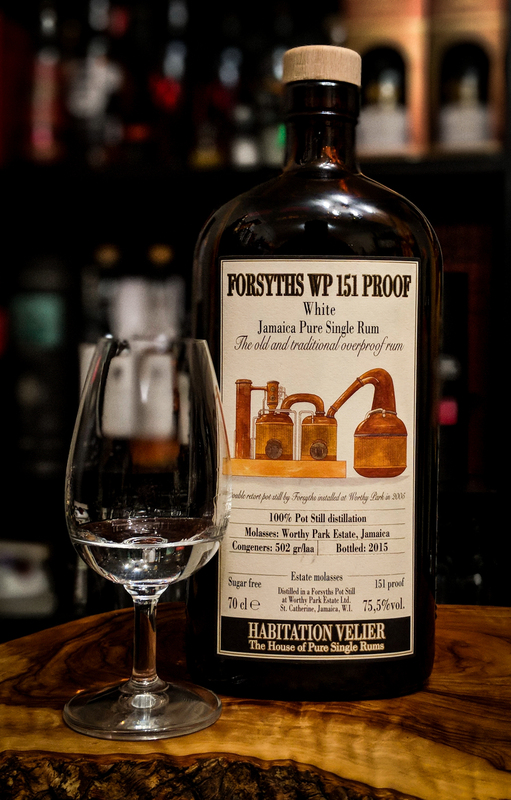 This entry was posted in Pure Single Rum, Pure Single Rum, Rum and tagged Forsyths Pot Still, Forsyths WP 151 Proof Review, Forsyths WP 2005 Review, Forsyths WP 502, Forsyths WP 502 Review, Gordon Clarke, Habitation Velier Forsyths WP 151 Proof, Habitation Velier Forsyths WP 151 Proof Review, Habitation Velier Forsyths WP 2005 Review, Habitation Velier Forsyths WP 502 Review, Habitation Velier Forsyths 2006, Habitation Velier Forsyths 2006 Review, Jamaica, Jamaican Rum, Jamaican Rum Review, Marsala Finish Rum, Nikos Arvanitis, Oloroso Finish Rum, Pure Single Jamaican Rum, Pure Single Rum, Rum Diaries, Rum Diaries Blog, RumDiariesBlog, St Catherine, Steven James, Worthy Park, Worthy Park Marsala Rum Review, Worthy Park Oloroso Rum Review, Worthy Park Rum Review, Worthy Park Signature Range Review, Worthy Park Single Estate Reserve Review, Zan Kong. Bookmark the permalink.